As connected cars become commonplace, automakers will have a harder time keeping their heads in the sand on security. A pair of well-known hackers have proven that they can take over a car’s vital functions—including brakes and acceleration—from anywhere with an Internet connection. As described in this fascinating (and frightening) Wired feature, Charlie Miller and Chris Valasek took control of Jeep Cherokee that reporter Andy Greenberg was driving. From 10 miles away, Miller and Valasek started messing with the car’s speakers and air conditioning, and then cut off its transmission in the middle of a busy interstate. The elaborate hack involved about three years of research, but requires only a laptop connected to a Sprint phone to make the connection. That’s due to the nature of Jeep’s Uconnect system, which runs on the Sprint network. Miller and Valasek estimate that 471,000 vulnerable cars are on the road today. Again, I highly recommend reading the lengthy Wired feature for the full, frightening story. In the meantime, Wired reports that U.S. Senators Ed Markey and Richard Blumenthal will introduce legislation to require tighter security in connected cars. A previous survey of automakers by Markey found “a clear lack of appropriate security measures,” with only seven out of 16 automakers saying they’d hired independent security firms to check their work. 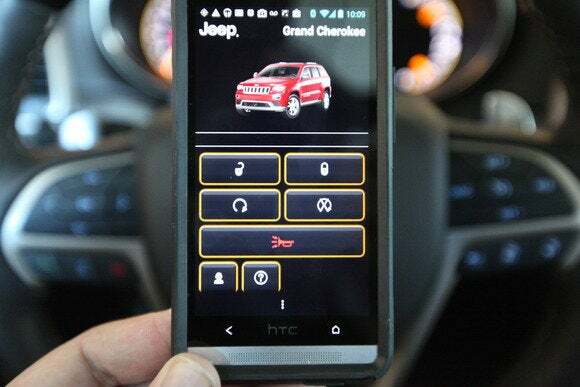 Only two of those automakers said they monitored for malicious commands on the network protocol used in the Jeep exploit. Why this matters: Car security was easier to dismiss in the past, when hackers still needed physical access to the vehicle. But as more cars gain Internet-connected smarts, covering everything from the entertainment system to the actual driving, Miller and Valasek have proven that this is a deadly serious issue. There are measures that automakers can take to protect their vehicles against hacking; hopefully the combination of legislation and real-world proof will prompt them to treat the matter with more urgency.